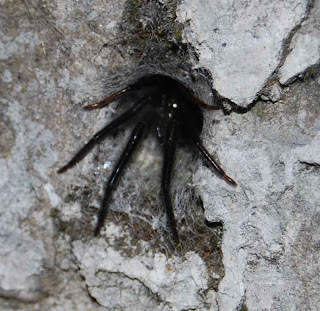 Segestria florentina is now naturalised in a number of areas in England, though according to the NHM web site it was only first described here in 1845. It was initially limited to port areas such as Plymouth and Bristol but there is some evidence that it is spreading. 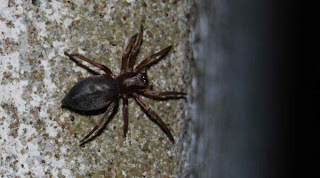 It can give a nasty bite (rare in a British spider), rarely medically significant but reportedly quite painful. They are also very fast and fairly aggressive, never the less they are quite beautiful and certainly fascinating. It is a good job I find them interesting rather than scary as they are common in the walls of our garden. They sense vibrations along the radial "trip-wires" of their tubular webs, which are usually set into cracks in walls, and then they dart out at great speed, grab their prey and immediately envenomate, retreating to their lair with their dying meal. 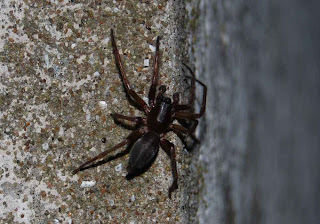 During May and June they wander from their tube webs during the night and search each other out to mate. The males can be differentiated from the females by their pedipalps and their marginally smaller size.